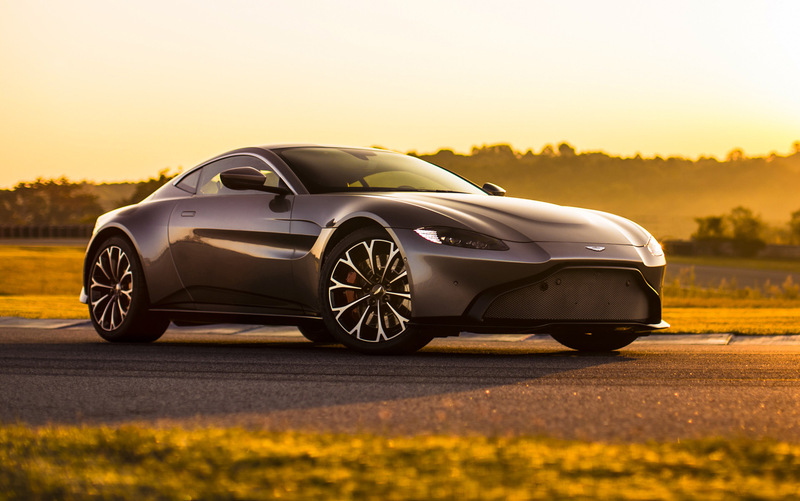 Vantage is raw and instinctive, unwavering in its singular purpose: to overwhelm the senses through its world-renowned design, agile performance and dedicated craftsmanship. Its heart beats with a high powered 4.0 litre twin-turbocharged V8, producing that visceral Aston Martin roar. A rare breed and a statement of independence on the road, Vantage embodies all that is beautiful in our performance sports car range. Race track, winding country road or the everyday commute, Vantage is an Aston Martin of outstanding class, delivering a drive so intensely felt that it demands to be experienced time and time again. The signature ultra-slim rear light graphic illuminates the full-width of the tailgate, accentuated by the flick in the Vantages tail. It provocatively expresses the cars animalistic character in what is set to become an iconic symbol of performance. The nose of the clamshell bonnet is pitched towards the ground, as if hunting its prey. Distinctive and assertive features like the three-dimensional S curve surrounding the meshed grille, or the focused expression of its ultra-slim LED headlights, instantly portray Vantages beautifully intense visual character. The traditional side strake has been reinvented for more dynamic benefits, ducting air from the wheels to reduce drag. The front splitter is integral to Vantages aerodynamic design. As well as delivering true down force, it assists cooling by feeding air to the braking system. In a first for an Aston Martin production car, the underside of the car has been designed to guide airflow from the front splitter to the rear diffuser, producing downforce for increased grip and enhanced stability. Vantages high-performance V8 power house is positioned low and further back in the chassis to improve weight distribution and driving dynamics, leaving a lasting impression well beyond the drive. Effortless, inherent potency comes from the engines extraordinary 510 PS output and 685 Nm of torque fed through Vantages ZF automatic transmission. The eight-speed gearbox delivers the perfect balance of performance and refinement, with adaptive software designed to gauge the operating conditions along with the demands the driver is making to ensure the car is in exactly the right gear at the right time.